When early autumn arrives, that is usually the first time in months that there is an opportunity here in the Deep South to turn off the air conditioning, open the windows, and let cool air drift through the house. The very first cool front to come through is joyfully welcomed. This is especially nice at night. There is nothing like going to sleep with that initial cool, autumn air hanging over you. What makes having the windows open at night so pleasant is not only the coolness but the aromas. 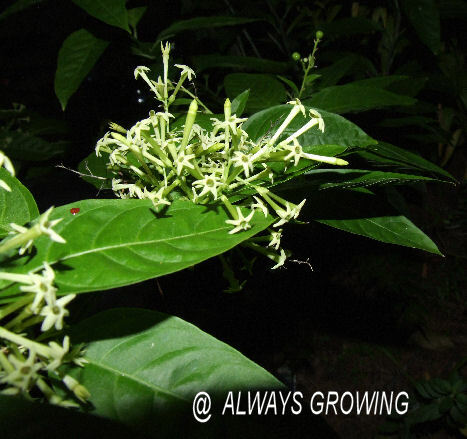 In late September, the night blooming jasmine (Cestrum nocturnum) starts releasing it fragrance. What a wonderful way to drift off to sleep. This plant is not used very much today which is a shame. Before air conditioning became common, this used to be planted outside of windows to perfume homes and especially bedrooms at nighttime. When my bushes started blooming, the aroma brought me back to my childhood and my maternal grandfather. One of my most vivid memories is visiting my grandparents’ rural home and going to sleep with the night blooming jasmine’s fragrance in the room. My grandfather always planted this outside the bedrooms. Since this shrub only blooms at night, and the fragrance is only released at night, it is perfect outside an opened bedroom window. 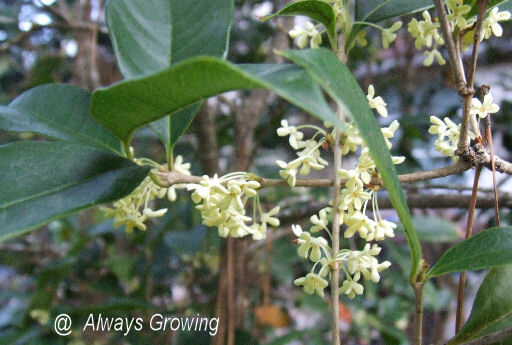 Another sweet-smelling plant that is blooming now that it is early autumn is the sweet olive (Osmanthus fragrans). 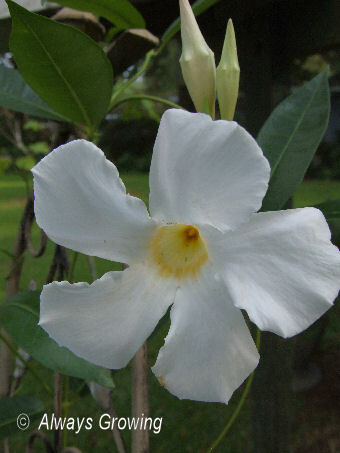 This blooms in the daytime with tiny, deliciously fragrant flowers. Don’t let the tiny flowers fool you, this plant’s aroma can travel. Often when I return home from work in the late afternoon, I can smell these flowers even though the plants are in the back garden. When this plant blooms, I am reminded of my father. I remember that he brought home a fairly large sweet olive that he rescued from a construction site when I was quite small. He planted it in our side yard and was so proud of that tree. As a child, I would pick a small sprig of flowers and was amazed that such tiny flowers could have such a big fragrance. By the way, that tree is still alive at my parent’s home. It has been there about 55 years having outlived my father. Both of these plants are extremely fragrant, but those fragrances are not overpowering or cloying. Having these glorious aromas and cool temperatures around are among the things I look forward to every autumn. I guess it seems like I have fallen off the face of the earth since I haven’t posted in so long. Let’s just say that life and work (don’t even talk to me about computer conversions) has gotten in the way of my blogging. Not that anything has really been happening in the garden, so you haven’t missed anything. The brutally high temperatures are finally gone, and the extreme drought, thanks to Tropical Storm Lee is over. The summer plants are all just about toast now, but those that do well in autumn are starting to make a show. I can’t wait for even cooler weather so that I can work out in the garden every weekend. There have been several signs that even with temperatures in the high 80’s, fall is beginning to settle in. Many plants that only shine in the fall are starting to change. 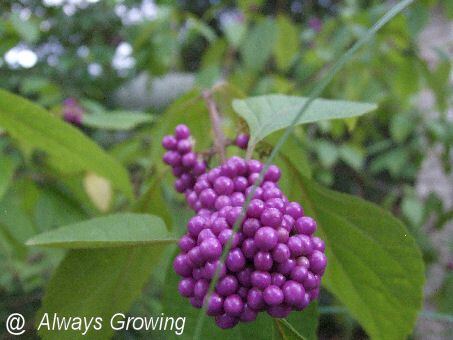 The beauty berry bushes are now sporting their gorgeous magenta berries. 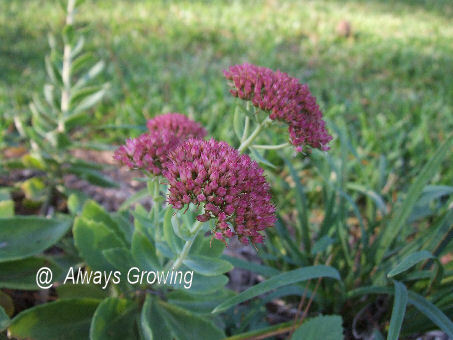 Sedum Autumn Joy is also showing its lovely, rosy, fall color. This is the second year this has been in my garden, and I am so pleased with it. I know many gardeners think of this as just a common plant, but it really has not been grown much down here, and I love it. 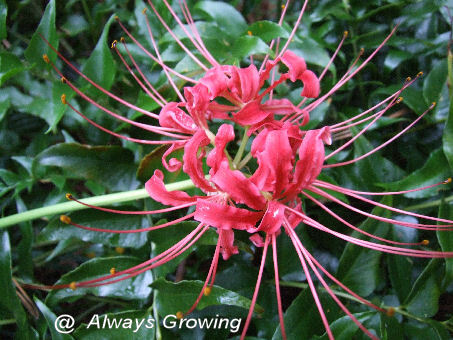 A week or so after Tropical Storm Lee passed through, the hurricane lilies (Lycoris radiata) began to show up. These are often called hurricane lilies around here because their bloom time coincides with the peak of hurricane season. I remember after Katrina these were blooming only a week later. 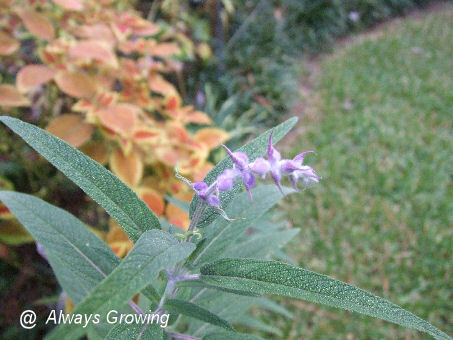 The Mexican Sage is just starting to bloom. It won’t be as thick and nice as previous years because I forgot to cut in back in early summer. Finally, a new addition to the garden is starting to earn its keep. This spring I bought an ornamental grass that I first saw about three years ago but was not able to find it locally until this April. 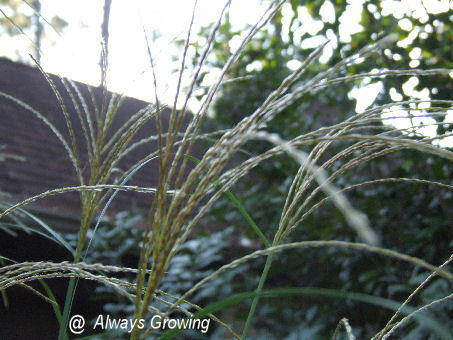 This miscanthus Cosmopolitan is a large grass that puts out the loveliest wheat-colored tassels. I was beginning to worry mine wouldn’t have any this year, but look what has finally showed up. In a week or so when the tassels all come out fully, this grass should look fantastic. I can hardly wait to see it in full bloom. At least there is one bright spot after such a drought-filled summer. It shouldn’t be too long before the other autumn flowers show up. It will be nice to have the confederate rose and others around in the cool weather. Then, maybe I will have something to share and there won’t be such a long time between posts.